Last year in September I wrote about the upcoming soon-to-be-forgotten disaster that is Spring Breakers, a movie consisting of half-naked ABC Family and Disney stars like Selena Gomez, Vanessa Hudgens, and Ashley Benson. 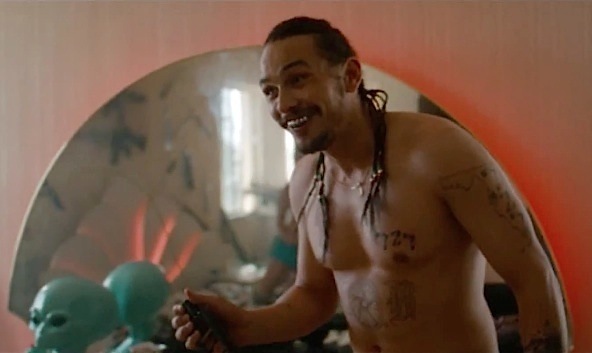 James Franco, who once wrote about the difference between fantasy and reality and only working on movies he “cares about,” is a cornrowed nightmare in this, smiling his creepy metal grin at young girls who appear to be the fantasy to his nightmare. “Bikinis and big booties ya’all, that’s what life is about,” he yells. Ashley Benson seems to say “Pretend like it’s a video game” as a preconceived response, then Skrillex’s “Scary Monsters and Nice Sprites” plays to hypnotize the viewer into thinking the movie could be a fun alternative to drugs. Oh, and here’s the international trailer, if seeing the girls brought in front of a judge in string bikinis (because the county just ran out of clothing) without French subtitles wasn’t enough for you.